1956 by E. A. Beletskiy et al. ^ ا ب پ "China II: Sinkiang - Xinjiang". Peaklist.org. Retrieved 2014-05-26. ↑ Note: The footnote in this source states: "The frequently cited 7546m elevation should be replaced by the newer 7509m elevation that appears on Chinese maps, and is more compatible with SRTM . 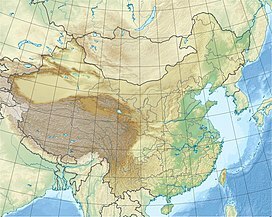 ""China II: Sinkiang - Xinjiang". Footnote#9. Peaklist.org. Retrieved 2014-05-26.